My dog is busybusy all day long and never stops! You may enjoy your dog keeping you company all day - but if your lifestyle is very active and busy you’re actually not helping him! Like toddlers, dogs need to have naps and calm periods built into their day. They are crepuscular beasties - which means they are most alert at twilight, their ancestral hunting time. And just like toddlers, not getting these vital rest periods will result in disturbed behaviour. For your dog this means that he’s much shorter-tempered, easily agitated, hard to reason with. This is making your life much harder than necessary! And if you are blessed with a Growly Dog who is already disposed to reactivity, fear, anxiety, or aggression, you can 10x that! Plenty of ideas in this free 8-lesson email course for calming down your life with your dog! And as we know that stress is the silent killer for humans, so it can be for dogs, predisposing them to ailments that they are unable to resist. I wrote about sleep and puppy-biting a while ago. And I’m revisiting this subject because it is SOOOO important, and so seldom understood! 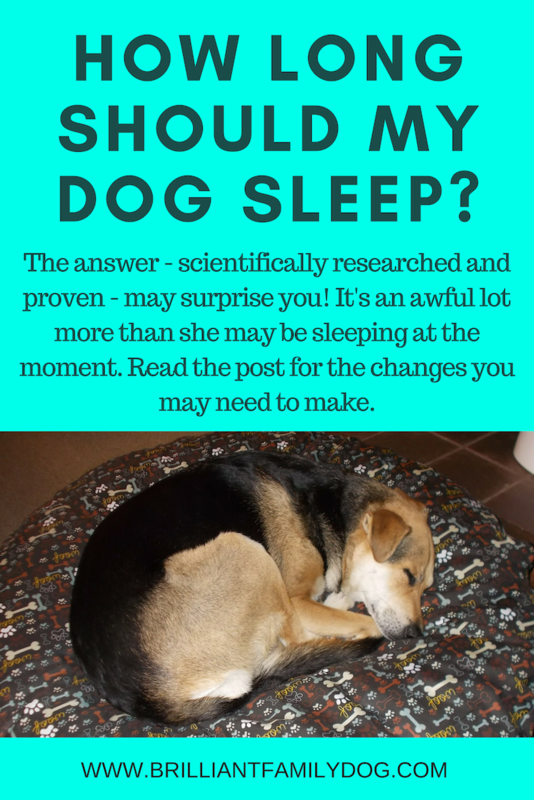 So how can you curb your frantic dog’s activity and improve life for both of you? The first thing to do is establish sleeping areas in the home where your dog can sleep without being disturbed. So rather than letting your puppy crash where he runs out of steam, always transfer him to his crate or bed. Build these sleep-places into your day from the start. Protected sleep times are also important to build in from Day 1. My dogs are all adult, and as I write they are all in or on various beds near me. They sleep while I work (lucky them!). This pattern of “when nothing’s happening you need to sleep” is carefully baked in from the day the puppy arrives with me. A puppy who’s been awake for more than an hour or so needs to go to bed! But you can still teach an older dog this way of life, even if there are established patterns of lunacy! Here’s an extract from my book series Essential Skills for your Growly but Brilliant Family Dog which you can find here. I’m repeating it here because it illustrates so well how quickly you can influence some of your dog’s behaviours when you approach it the right way. “I was visiting a very caring couple who had brought their young rescue collie Tim to classes when they first got him. I was glad they’d got in touch again, because the young dog was very fearful and couldn’t cope well with life. We arranged a visit. While there, it became clear that this hyperactive dog was wearing himself out. For the first twenty minutes of my visit he never stopped. He raced in and out of the room, jumped up my front, my back, chewed my hair, poked the other dog, ran off again, paced … never rested. So I quickly amended my training plan to include some relaxation work. After some active games to get Tim to engage with me, I started teaching him to slow down and relax. After just five minutes of this, his owner expressed amazement at seeing her frantic dog actually lying down still for more than ten seconds at a time! When I finished the short session and released him, what did he do? Do you think he went straight back into busybusy mode, panting and racing? Nope. He just slid onto the floor beside us, and as he lay there his head started to loll, his eyelids drooped, and he was … asleep! To the total astonishment of his owner, who had never seen him sleep in the day! So how much sleep should Tim be having? Did you know that dogs need to have an average seventeen hours of sleep a day to work at their optimum level with the least amount of stress? Well, it’s seventeen hours for adult dogs - obviously more for puppies. And some dogs need to be helped to achieve this total. Tim had had a poor start in life before his present owners took him in and gave him a secure and loving home. So he’d developed habits of nervous and stressy behaviour which had stuck with him. Showing him how to relax transformed him in just a few short minutes and allowed him to get some much-needed rest. Want to know what I did to relax this hyper dog? To get the exact program, work through the first book in the Essential Skills for a Brilliant Family Dog series: Calm Down! Step-by-Step to a Calm, Relaxed, and Brilliant Family Dog It’s free at all e-book stores, and also available in paperback online and you can order it from any good bookshop. Quite apart from the usefulness of this skill for any dog, anywhere, if you have a reactive dog it will hugely benefit him. The object is quite different - to change your dog’s mental state, not to anchor his physical position. Learning how to switch off can also help with Separation Anxiety. If this is an area of distress for your dog, you could do with going through a whole protocol to make positive changes. This book by Patricia McConnell has a step-by-step program. It’s not an overnight fix, and few people in my experience can be bothered to resolve this issue for their poor dog - unless he’s destroying the house and defecating all over the carpet. But think how much happier you’ll all be if instead of agitated pacing when you’re out, you just get peaceful snoozing. I’ll also mention the Relaxation Protocol. (These audios have been generously provided by Roxanne Hawn and are free to download.) This is a program which takes incremental steps from frantic non-resting dog to chilled-out dog with a lower heart-rate and dreamy feelings of comfort and relaxation. It’s a simple program: you don’t have to do Day 1 only on Day 1 - repeat each “Day” till you have it right, then move on to the next “Day”. I choose to have the dog lying down for this - more conducive to dozing. It takes time, yes, but it’s time well spent helping your dog destress. You’ll feel as if you’ve had a relaxation session yourself when it’s over! It’s worth getting started on it to help your dog access the calm side of his mind, which he may have lost sight of in his anxiety. Again, few people in my experience follow through on this and complete the cycle in several different places. But those who do get MASSIVE improvement! It’s especially useful for the never-resting dog, the hyper dog, the anxious or fearful dog, your Growly Dog.